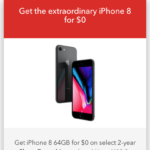 Fido has a new ‘promo’ available, which is essentially advertising two current offers available to customers, and works out to a $45 plan with 3GB of data. What you’re seeing in this plan is a 2GB data per month bonus, coupled with a $10/month credit (for 12 months). So after 12 months, this plan will jump back to $55 per month for 3GB of data, which is not a good deal at all, when compared to the recent $60/10GB offer offered by Rogers, Telus and Bell in BC, Alberta and Ontario, to compete with Freedom Mobile. This promo is not as good as when Fido matched Public Mobile’s $40/4GB plan and doesn’t come close to the $60/10GB plan. Other promos worth taking a look at instead of this is a 32GB LTE iPad for $299 on a two-year data plan (no term price $619), with a $15 per month 3GB data plan. Update: A Fido spokesperson emailed to inform us the 2GB data bonus no longer ends after 24 months, as the website now has new terms. The bonus data is permanent as long as you remain on this BYOD plan. This article has been updated to reflect the change. IMPORTANT: For all customers that have activated or upgraded on this plan since December 14, 2017, the 2 GB Bonus Data will not end after 24 months as was initially indicated. 2GB data bonus available with new activation or phone upgrade on in-market 1GB Data, Talk & Text plans, and 1GB, 4GB and 10GB Fido Pulse plans.